Come and discover the Yelloh! Village Lous Seurrots, a beautiful piece of land surrounded by 15 hectares of pine forest and situated between the river and ocean. Everything in an exceptionally beautiful, natural environment of beaches and pine forests. 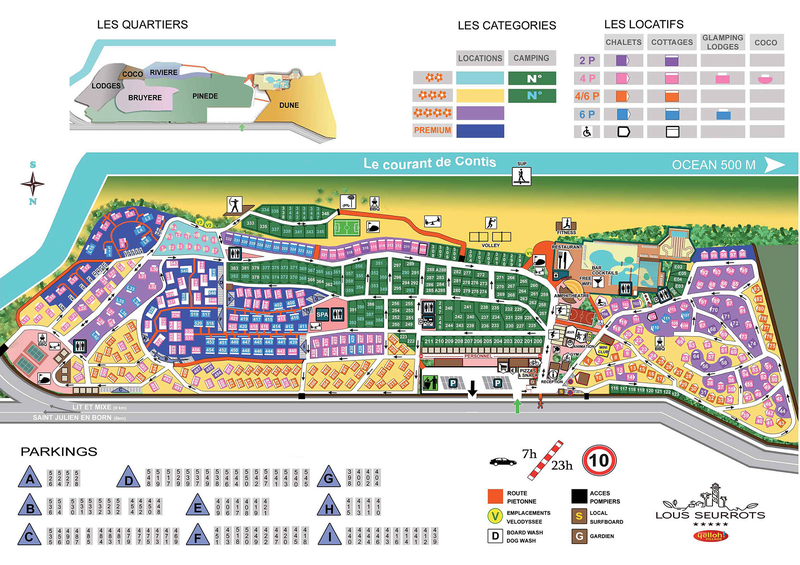 Your next camping holiday in Aquitaine will be at the Lous Seurrots camping! A very nice, end of season, 2 night experience. Absolutely loved it, so clean, well kept, friendly staff and lots things to do! Lots of nice upgrades made since our visit 12 months earlier, new snack bar and spa. we will certainly be back next year. When you choose a camping holiday in Contis, you will spend your days close to nature. The Lous Seurrots campsite is located in the heart of the forest, a few minutes from the most beautiful beaches in the Landes region. The small Contis river runs alongside the camping before flowing into the ocean. - The Contis lighthouse: a majestic structure stands by the ocean, provides an exceptional panoramic view. - The beaches and lakes: Take your bike and ride through the forests on bike trails. You will discover the coastline's vast beaches, such as Mimizan or Contis. A surfers' paradise, the latter is only 500 metres from the campsite. France's 2nd largest lake, Biscarosse, is a bit further to the north and offers a peaceful setting and ideal place to practice water sports. Finally, discover the Basque folklore with a visit to Dax. The city is well known for its corrida, as well as for its gastronomy and specialities from the Landes region, such as foie gras, duck filets and Armagnac. Gastronomy, culture and exceptional landscapes will make your camping holiday in Contis an unforgettable experience!